The 37.8 metre motor yacht Carte Blanche, listed for sale by Mark Elliott at IYC, has been sold with the buyer introduced by Peter Kinn at Worth Avenue Yachts. 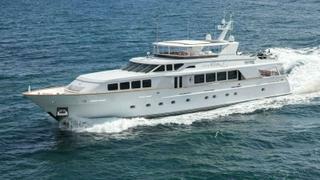 Carte Blanche was built to ABS class by US superyacht yard Trinity Yachts and delivered in 2002 with a refit in 2012. Interior designer Dee Robinson gave Carte Blanche Art Deco accents throughout her cherry wood, maple burl and mahogany interior, accented by black and bronze columns between her main and dining saloons. She splendidly blends an artistic, romantic interior experience with great al fresco deck spaces for outdoor entertaining and dining. This all-aluminium yacht has an excellent charter history, sleeping 10 guests in a full-beam master suite, three double staterooms and a twin cabin, all with en suite facilities. Twin 1,800hp MTU engines give Carte Blanche a cruising speed of 15 knots and a range of 4,700 nautical miles at 12 knots. Carte Blanche was asking $5,294,000.